2,020 people read this post. Everyone has a story of sorrow to tell. Whether the individual at hand is a thief or the subject of theft, a traitor or the subject of betrayal, single or married, rich or poor, healthy or otherwise, know very well that there is not a single individual who is an exception to this rule. With that said, I will present 15 pieces of advice. May Allāh make them a means of comfort, relief and recovery for the brokenhearted and troubled, and a means of victory for the individual battle that every one of us fights. The first: Never forget that the One who has chosen for you your calamity is Allāh, and that the true meaning of ʿUbūdiyyah (being a slave to Allāh) is to surrender to that, having accepted with contentment what He has accepted for you. Remember who is testing you; A Merciful and Wise Creator who does not want to devastate or destroy you, but wants goodness for you more than you want it for yourself. The third: Realise that your difficult circumstance is in fact a medicine that Allāh has generously sent in your direction. Bitterness is the nature of medicine; embrace it and do not display displeasure at Allāh and impatience, otherwise its healing properties will be lost. Often an arrogant, prideful and chronic sinner is stopped in his tracks through a disaster that collapses him. Thereafter, he has been forced into humility, having transformed into an individual of Salāh, Qur’ān, Duʿā’ and righteousness. Rest assured, for the medicine of calamities will rid you of illnesses that you may not be able to see, but are illnesses that need to go. Were you to realise that your anxiety and difficult circumstance is in fact your elevator in the Hereafter, such anxiety becomes much easier to deal with. The tenth: Deal with your worries by benefiting people in whatever way you can. If life seems unbearable, search for a poor person and feed him, loan someone a sum that he needs, console those who are sad. In fact, even something as small as making space for your brother to sit next to you within a busy room plays a major role in opening up your heart with joy. Make space in the lives of people, Allāh will make space within your heart, in your wealth, in your health, and in your grave. Whenever you feel like the weight of anxiety has become overpowering, call up a friend and invite him to the Masjid for the purpose of reciting Qur’ān together and to read from a book of Tafseer together, and simply observe the change in your heart. The thirteenth: It could be that Allāh has tested you in order to push away from you something far worse that was making its way to you. You have no idea what is being planned for you. The scholars narrate a story of a king and his minister. The latter was a righteous man who, in the face of every disaster, would always repeat the phrase الخيرة فيما اختاره الله / “Allāh only chooses what is best”. They were once eating together when the king cut his hand badly. As usual, his minister said, “Allāh only chooses what is best”. The king however saw this as an insult, as if the minister was gloating at his suffering, and therefore imprisoned him. The minister reacted to this by saying “Allāh only chooses what is best”. The king used to spend much of his recreational time hunting which he’d usually do with his minister but seeing that he was now behind bars, the king went out hunting by himself. As he pursued an animal, he failed to realise that he’d crossed the boundaries of his land and entered into a land of idol worshippers. He was caught by them and escorted to their greatest idol with the intention of offering him as a sacrifice. They lowered him to the ground and brought the knife to his neck when they realised that his hand was wounded. With this flaw, they considered him unworthy of being offered as a sacrifice and thus they set him free. b) Shrink it by thanking Allāh that your calamity itself was not worse. If you have lost an eye, thank Allāh that you did not lose both. If you have broken an arm, thank Allāh at once for it not being your spine. d) Shrink it by counting the favours of Allāh upon you. How sad it is when we become blind to the countless blessings we have been showered with and can only see the one blessing that has left us. Is this fair? e) Shrink it by remembering that, much like a summer’s cloud, it will pass. Contemplate over those who were previously tested with certain illnesses or the loss of loved ones. How were they at the time? Some perhaps doubted that they would ever recover, but with the passage of time, they did recover, they moved on and what was once a heart-wrenching tragedy became a distant memory. All those whom you see around you at present smiling, laughing and enjoying their lives, did they not cry with pain at one point in their lives? They did, but with the passage of time, it all changed. f) Shrink it by simply looking around you. You will quickly come to realise that everyone is suffering in one way or another. Hardship during pregnancy, during labor, during your pursuit of education, work and then marriage, hardship of raising children, hardship of bad health, of old age and then the pangs of death. Whoever expects a trouble-free life or perceives that he is the only one suffering or imagines that he is suffering the most is mistaken, for everyone is being examined. In fact ‘AbdurRahman AnNaasir, one of the greatest governors of Andalusia, used to take note of the days in which he felt at ease. He lived a life of immense hardship and struggled enormously against those who sought to destabilise him. When he died, they looked at the days of ease that he had taken note of. They amounted to only 14 days, despite him having governed Andalusia for over 50 years. I ask Allāh to allow us to take that step, but up until we do, brace yourself for every potential circumstance that life may throw at you. This is the Dunya and we are all in the same boat. May Allāh make these 15 points be a means of relief and comfort during our short-lived journeys to Him and the home of the Hereafter. 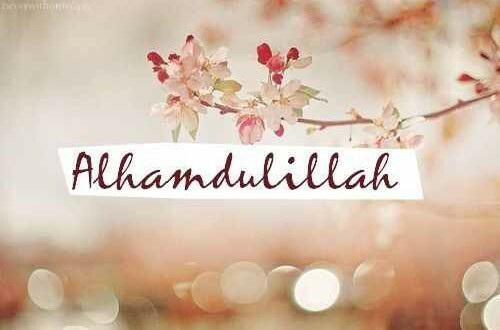 It really is from Allāh’s mercy upon our weak selves that He has not connected absolute happiness to anything other than Him. Not to wives, husbands, jobs, children, countries, wealth, health or anything else, as these matters, if lost, can be replaced, or at least partly replaced. But, if Allāh is lost in the life of a person, what can replace Him? True misery is not in losing any of the above, but when the irreplaceable One is lost.